Here are some tools and sites which may prove helpful to webmasters, developers, and marketers. More tools are to be found on our other pages, and throughout the site. FreeMailer2000 When you sign-up for Free, you will get your very own personalized FreeMailer2000 website along with your Unique URL. When someone signs-up from your FreeMailer2000 website, they become your First Level Downline. Similarly, when someone else signs-up from their Unique URL, they become your Second Level Downline and so on till 15 Levels. The trade off here is very light, only 14 people are able to send email to you in return. Webings are a great way to surf the web by topic, and a good method of getting your pages noticed for webmasters. Trillium University maintains an archive at Ware.netfirms.com for software (and links to downloads) which you might find benificial. We are a member of ISOC, the Internet SOCiety. If you need professional help, send me an e-mail describing your needs and how to best contact you. Turns your IE Exported FAVORITES into a real webpage, adding html, head, style, and body tags while removing the date_last_visited kind of attributes and letting you add your own title and stylesheet path/name. You will find a large variety of tools for both commercial use and novice webmasters alike. Often a free version exists which will meet your early needs. What is a tool you ask? The answer is, any program which you might find helpful in developing your site or business. Our selection of tools and references are growing constantly, and is spread across almost our entire site. So feel free to browse about, pick and choose to meet your needs. Click here for Neoworx products include route tracing (to see the internet route used to another online computer.) This is just totally cool and if you dig, you will find not only a free version, but an affiliate program as well. Fast, easy to use, very interesting. Add some news to your site, and make a buck at the same time. This company provides an email autoresponder. Hosting services include free tools and website hosting. Click on the banners above and make a website within the hour. Premium services are exceptional and they have all the goodies and services you expect from a host. Business on the internet made easy. This site is maintainde by us! Cool software and links. 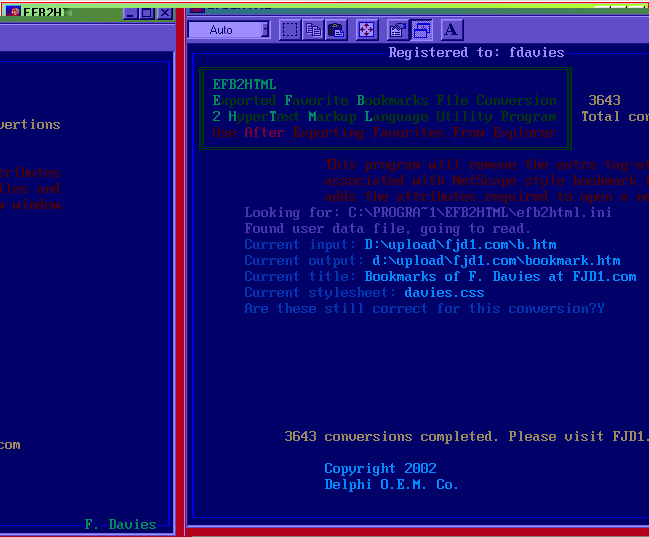 Intended for students, many are shareware or freeware. OUR too cool gizzmo! Yes, this is very new. If you have a site, please have a look. We wanted to create an online starting point for automatic surfing. A person can choose to view a series of webpages, stopping and restarting as they desire to look around and continue or go back. AutoSurf will add your site to such an automatic browsing loop, and supply the meta tag and code needed. This can just as easily be applied to a series of pages to present them much like a slide show. Great tool for educators!